The next stop on our trip across Europe was Vienna, we caught the train from Budapest station and settled in for a journey of about three hours, train travel in Europe is much cheaper than at home so we have treated ourselves to first class tickets as far as Brussels then cattle class on Eurostar which is much more expensive. We enjoyed having more room and waiter service at our seats. Once in Vienna, having dropped our bags at the hotel we went for our usual wander round the local neighbourhood and found somewhere for an early supper. Next morning we were thrilled to find that the weather had held for us and we had another beautiful, crisp, bright spring morning. We stuck to our plan from Budapest and explored on foot; first stop was the Belvedere Palace to the south of the city; our route took us through the historic Naschmarkt which was lovely, lots of interesting food stalls and cafes, sadly we had just had breakfast so even I couldn’t come up with an excuse to stop and buy anything! The Belvedere Palace is now a gallery and houses a large collection of Gustav Klimt paintings which was the reason for our visit, however we really enjoyed and exhibition about an Austrian artist called Tina Blau whose paintings from the turn of the C19th prefigured many characteristics of the impressionists, her life story was pretty amazing too, she led a very independent life as an artist when that wasn’t an easy thing for a woman to do. After the gallery we walked back in to the centre of town in search of a restaurant for lunch, we both wanted to try Wiener Schnitzel in its home town. We found a restaurant called Wien and Co down a side street near St Stephens Cathedral, we later found out that it is part of a chain of about 4 wine shops/restaurants across Vienna, all of which are very highly rated, what a lucky break. We both ordered the Wiener Schnitzel (very thin breaded veal steak) which was served with herbed new potatoes and a green salad, we also ordered a bottle of local red wine, it was the first wine we had had since New Year’s Eve; while we travelled through SE Asia we tended to drink whatever the local drink and none of our stops was in wine country. While we waited for our meal the waitress brought us a basket of fresh bread, including a loaf with chunks of black pudding baked in it, and little dishes of things to have with it. One of the dishes turned out to be pork dripping, salty and with tiny pieces of crackling in it, one bite and I was transported straight back to my grandmother’s kitchen! I haven’t had dripping for years but it was delicious. The whole meal was fantastic, simple food served perfectly cooked. It occurs to me as I write this that quite a lot of our blog posts have focused on food (it has been pointed out to us!). I’m not going to apologise. We have had some wonderful meals in the course of our travels and have received such a positive response from local people when we have tried, and enjoyed their food that it has been one of the most memorable recurring themes of the trip. We have already ordered a Sri Lankan cookery book which should be waiting for us when we get home and have picked up some recipes along the way which I’m sure will become favourites once we are settled in Cornwall. Not again I hear you say! Anyway, back to Vienna… another bright spring morning dawned and we set off to find a Ferris Wheel Mark remembered from a school trip to Vienna when he was about 13, it is still a major tourist attraction so it wasn’t difficult to find but it was much further than we thought, still it was a nice day and the route took us along the Danube Canal so no complaints. The wheel was on the edge of a small amusement park which was open but empty which gave it a very downbeat atmosphere. Having walked that far we had to go on the wheel so we bought our tickets and climbed into what looked like a mini railway carriage for the ride. 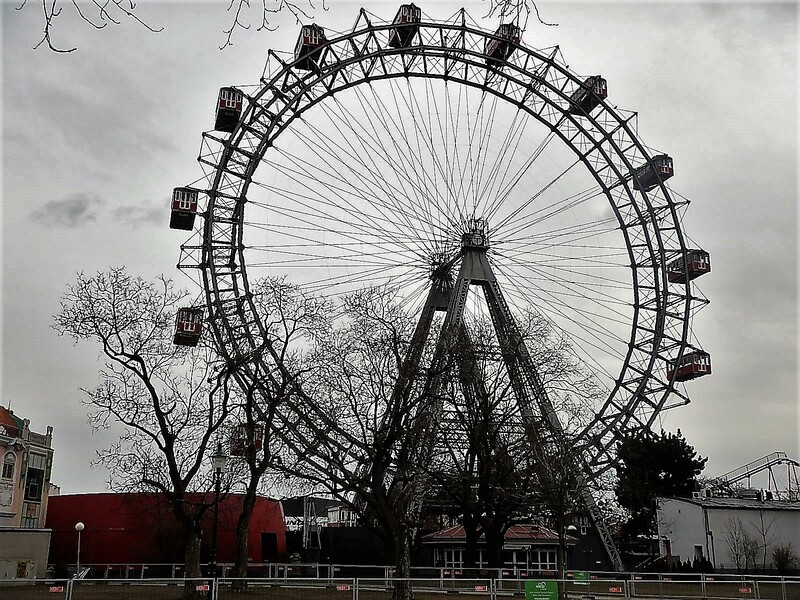 The views across Vienna were impressive, but the ride lacked a certain something, no matter, we had full filled Marks ambition to return to the wheel 50 years on from his first visit. 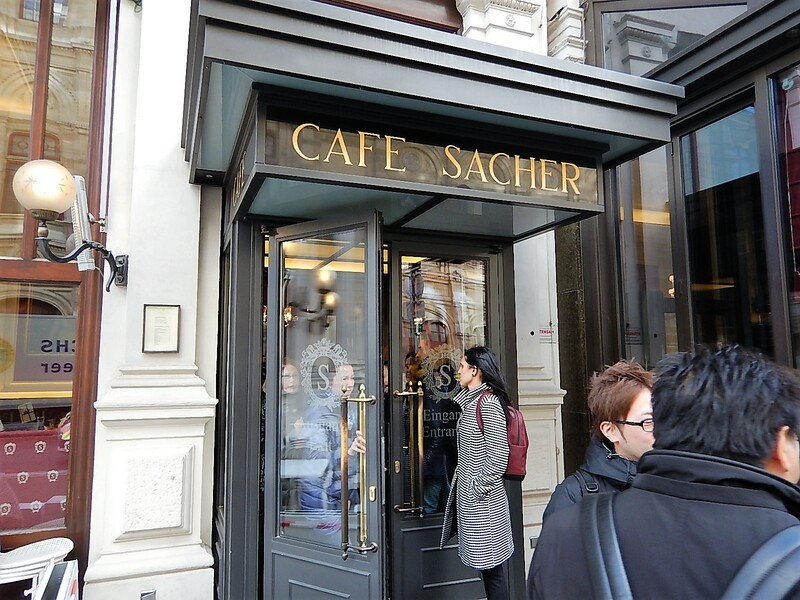 Next on the itinerary was a visit to the Hotel Sacher, home of the Sacher Torte and the only place that serves the chocolate cake made to the original, secret recipe. The hotel café was very ornate with huge gilt framed mirrors and red velvet upholstery. 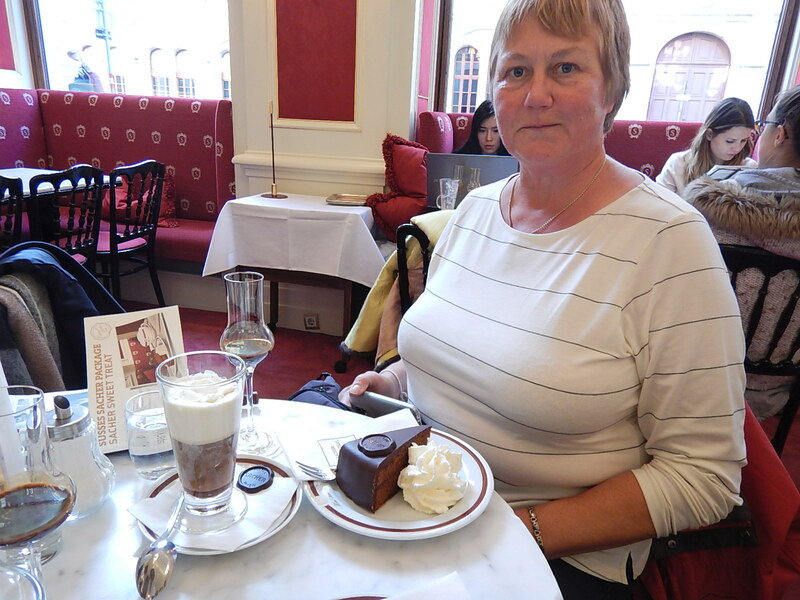 We ordered a slice of cake each with coffee and a glass of their own Sacher Liqueur, very indulgent and very rich! After that neither of us wanted a meal that night so we picked up some bread and cheese and a bottle of wine on the way home and had a picnic in our room. That was our time in Vienna up, where next?